Until the early 19th century, the village of Burnham consisted mainly of a few cottages huddled around the church but then several new houses were built and the first hotel, The Royal Clarence, was erected on the sea front. 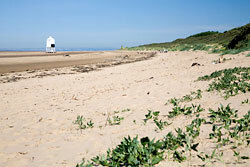 Around this time many families began visiting Burnham-on-Sea during the summer. Early in March 1897, a south westerly gale swept up the Bristol Channel, bringing with it not only high seas but also driving snow. Among the many ships that found themselves in distress was the Norwegian barque SS Nornen. She was driven towards Berrow mud flats and eventually foundered there. The wreck can still be seen today. Burnham-on-Sea has a lovely promenade overlooking Bridgwater Bay. There are views as far as Wales, across the Bristol Channel. There are seven miles of sandy beaches, along Burnham, Berrow and Brean, offering plenty of water sports and other activities including sand yachting, kite flying, donkey rides, fishing and golf. The beach is backed by sand dunes and has one of the highest tidal ranges in the world. There is also a jetty for launching boats and a pier pavilion. 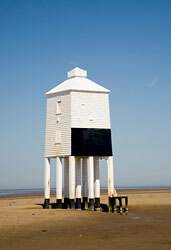 In addition, Burnham-on-Sea has an attractive and very distinctive nine-legged lighthouse. 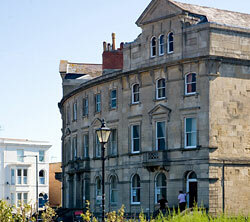 Burnham is also a thriving market town with a mix of high street stores and some interesting little traditional shops. With plenty of fish and chip shops and ice cream vendors it is the picture of a traditional seaside resort. The fascinating caves of the Cheddar Gorge are only half an hour away and Burnham is also within easy reach of Bath with all its attractions.